Have a seat on the large balcony and enjoy the beautiful view. 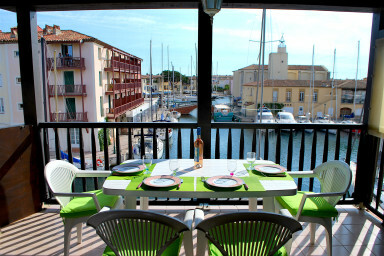 Pretty 2-room apartment In the very heart of Port Grimaud close to the facilities. The beach is only a few-minute away by walk. A large living-room with a sofa-bed, an open kitchen, a bedroom with a double bed, a bathroom and separate toilets. On the canal side, a wide balcony with a lovely view on the Church and the Marina. A cosy apartment located in a quiet area close to the center.